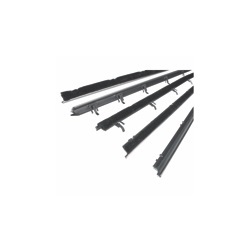 Side window horizontal seal (also known as beltline weatherstrip). These strips wipe the side windows when the glass is lowered. They come ready to install with finished ends and body curvature bends for a factory like appearance, and are made from original factory style material. This set includes the inner and outer seals for all side windows.